We live in a highly-visual society. Therefore, people get used to making quick assumptions based on what they see. Some studies propose that what people can see on the outside implies that what is going on internally is similar. * For instance, based on this reasoning, an unkept restaurant storefront outside could imply that a businesses does not care about food sanitation on the inside, etc. Whether or not consumers agree upon this reasoning, other reports support that physical appearance in general is something that matters greatly to consumers. 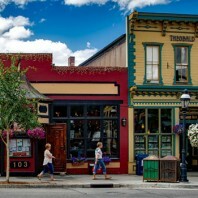 In fact, more than two-thirds of consumers say they have avoided a place of business based on its external appearance. Additionally, 52% of consumers said they have avoided a business all together because it looked dirty from the outside and 30% of return customers have not returned to a place because it was perceived as “dirty.”** Therefore, a fresh coat of paint for the interior or exterior of your businesses can add value to your business in many ways. considering adding an extra color to the door or trim to add the feel of being precise, caring, and detail-oriented. Whether it is a just a touch-up or a complete new coat of paint and color scheme, a fresh coat of paint can add curb appeal and attract new customers. If you are ready to improve your business, contact us and we can discuss options that may work well for you and your customers.